The Apple IIe (also known as Apple ][e or as Apple //e) was one of the most successful Apple computers ever. This model was based on the 6502 processor, which could run at 1.02 MHz and came with 64K of RAM and 16 or 32K ROM. The Apple IIe worked on BASIC, an assembly language interface, as well as on several other hard-coded options. The company used the name Apple //e from 1984, coinciding with the release of the Apple //c model. In March 1985 Apple introduced the Enhanced Apple IIe. 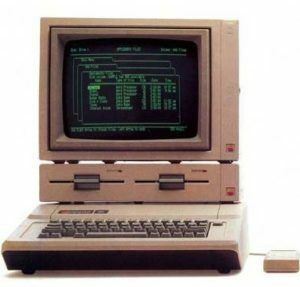 The enhanced model was identical in every aspect to the original Apple IIe with a few improvements (see below). In January 1987 the Platinum Apple IIe was released. Changes in this version were though cosmetic and superficial. The biggest difference consisted in the case color. Indeed the color was changed from beige to the then standard platinum/grey color. A numeric keypad was now built-in, besides the main keyboard had the same layout as the Apple IIgs and Macintosh SE (see also below). Introduction: Released in January 1983. Processor: CPUMOS Technology/SynerTek 6502. CPU Speed: 1.02 MHz. FPU: none. Bus Speed: 1 Mhz Register Width: 8-bit. Data Bus Width: 8-bit. Address Bus Width: 16-bit. Maximum RAM: 128 k, with Extended 80 Columns Card. Platinum edition, released in 1985, was shipped with 128 kB as standard. RAM slots: Expansion via the first slot. Expansion Slots: Eight proprietary slots. Operation System: Standard DOS 3.3 in 1983-1984. In 1984 ProDOS came around. ProDOS operating system. Video, Max Resolution: 40/80 x 24 text, 4-bit 40 x 48, 6 color 140 x 192, 4-bit 140 x 192, 1-bit 240 x 192, 1-bit 560 x 192. (In fact 140 x 192 and 240 x 192 of 280 x 192, they were the very same video mode, displayed differently depending on what type of display monochrome or color was attached. With revision B boards, it was also possible a 4 bit, 80×48 mode. In fact, revision B boards which came with IIe had the very same videomodes as the //c). Input/Output by joystick or Mouse: DE-9. Terminated: March 1985, replaced by an updated Apple computer model. Price: Originally sold for $1,395. Two and a half years before the Apple IIe, Apple produced and unsuccessfully marketed a computer called the Apple III for business users. Some of its features were carried over in the design of the Apple IIe. Among them was the ProDOS operating system, which was based on Apple III’s Sophisticated Operating System (SOS). The Apple IIe was the first computer to be shipped with ProDOS operating system, which was used in the Apple III’s SOS (Sophisticated Operating System). In fact, ProDOS made the Apple IIe the easiest-to-use computer of its time. However, the first Apple IIe’s came with the standard of DOS 3.3. It wasn’t until 1984 that ProDOS came around. A few month after its release, Apple came out with a new IIe motherboard, labeled Revision B, that allowed the computer to display Double-Hi-Res graphics. It also added a special video signal available to slot-7. Double-Hi-Res graphics required an Extended 80 Columns Card plugged in (128 kB RAM total), as well as a Revision B or greater motherboard. Introduced in March 1985, the Enhanced Apple IIe was almost identical in every aspect to the original IIe. The only difference was thatfour socketed chips had been changed on the motherboard: 6502, CD and EF ROMs, and the Video ROM. The 65C02 CPU added more instruction sets, the new ROM firmware fixed bugs and improved Applesoft BASIC, Monitor and 80 column routines. The Enhancement was to make the IIe machine more compatible with the Apple II+ and IIc models. The original IIe (including the revision A board) could be rapidly user upgraded by simply swapping the 4 chips. The company even sold an Enhancement kit upgrade. The new Video ROM added “MouseText” characters in the Apple IIc, not in IIe. The Platinum Apple IIe’s motherboard was functionally identical to the Enhanced IIe, though the number of RAM chips making up 64 kB had been reduced – it had wwo chips instead of eight. The 16 kB ROM was merged into a single chip – CF ROM, the shift-key mod was shorted to “active” by default. This version also was shipped with 128 kB as standard (a drastically reduced version of the Extended 80 Columns Card was pre-installed in the auxiliary slot of each unit). By 1991 Apple came out with the Apple IIe Card for the Macintosh LC series. It consisted of a PDS card with 65C02 CPU, 128 kB RAM, IWM and a Mega II chip (previously used in the Apple IIGS–the chip essentially is an entire Apple IIe on a single chip, minus RAM, CPU and ROM firmware). The Macintosh emulated Apple II video modes using QuickDraw and loaded the IIe’s firmware through software. An Apple II 5.25 floppy drive and joystick could connect to the card. It could run up to 2 MHz and many slot card add-ons could be emulated by utilizing Macintosh hardware (i.e. SuperDrive, AppleTalk, serial, expanded memory, etc). On Apple IIe, third-party aux-slot memory cards later allowed expansion up to 1 MB. The 1 K 80-column card also enabled one new graphics mode, Double Lo-Res (80×48 pixels). The extended 80-column card enabled two, Double Lo-Res and Double Hi-Res (560×192 pixels). While it was possible for software to switch out the 80-column firmware, making the firmware of a card in slot 3 available with a card in the auxiliary slot, it was not a common thing to do. However, even with the 80-column firmware enabled, slot 3’s I/O memory range was still usable, giving it approximately the capability of slot 0 on a II or II plus. This meant that it actually was possible to use slot 3 for coprocessor cards and language cards, that did not use slot firmware space. As we already stated, the Apple IIe was the most popular Apple II ever built and was widely considered the “workhorse” of the line. This model also has the distinction of being the longest-lived Apple computer of all time, as it was manufactured and sold with only minor changes for nearly eleven years. You ask yourself where to sell your used Apple computer? You can sell it to IGotOffer, we buy old computers for cash. And we buy any other electronic device you don’t need anymore: Sell old Apple computer online now. Apple IIe unboxing and demo. Video uploaded by myapplezone on September 29, 2011. You could add the the Apple II computer was introduced at the West Coast Computer Fair. And yes, the Apple II launched the Apple company into a successful business. Besides throughout the years Apple introduced many updated versions of this model which was produced even in 1992 or 1993. By the end of its production up to six million Apple II and Apple IIGS series computers had been sold. Essential Specifications is missing the physical dimensions (height, depth, width, etc. in inches). You need an original Apple Computer, Inc. spec. sheet for the physical dimensions. Hi, James. Thank you for your input. You are right, but we couldn’t find any info about the physical dimension. That’s the problem, if you can help, welcome…. Hey, I found this info about Apple IIe on Wikipedia where they added a link to a text about the first Apple computers ever Apple IIe specifications included. I tend to say that I’m very grateful to the autours of this texts as it greatly helped me to receive 100% on my year project about Apple history.